Are you going neither up nor down? Thanks very much to Delana for today’s dream question. Delana writes that she dreams of being under some stairs and has her throat cut by someone. This has been recurring every 4 or 5 years for about 20 years. While the stress is not great at work, her primary relationship could be better. Wow! There are some really strong themes and symbols here: stairs, the general idea of being attacked, and the very specific area of the body being cut, the throat. 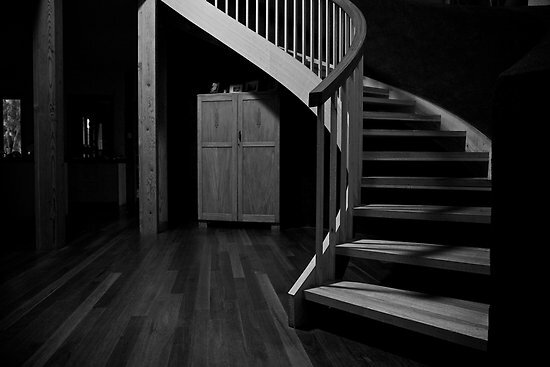 I have written in detail about stair cases in this link (https://thedreamwell.com/2008/08/25/dream-symbols-stairs-staircases-and-lifts/) But this particular dream is interesting, as Delana is neither descending nor ascending the stairs – she is under them. If stairs can represent how we feel we are making progress in some area of our life, then being under the stairs seems to indicate that Delana is not moving. Under the stairs is also a place we put things we have no other place for – things we want out of sight, things we don’t use that often or things we want to forget about. What might Delana want to hide, or hide from? That she is being attacked in the dream helps us understand this terrible fear. There is more on attacks in general here (https://thedreamwell.com/2008/08/06/dream-symbols-attack/) Attacks can represent internal conflict we have, or our own “self critic” who tells us where we fail, where we are not good enough, everything that we are bad at etc. This particular attack is on Delana’s throat. The throat often represents our voice – our ability to speak our truth clearly and confidently. The throat is also the connection between the head, the mental domain, and the rest of the body: the heart – our emotions, and the stomach – our gut feelings and instincts for starters. When the the throat is severed in a dream, as for decapitation (https://thedreamwell.com/2008/08/26/dream-symbols-headless-or-decaptitated/), it may mean that we are using our mind to ignore what our heart or instincts are telling us – we are literally not connected to our feelings. Is the internal critic – the “voice in your head” silencing another voice inside you that should be heard? Finally, our throat is how we receive both food and air into our bodies, when our throats are cut, we are cut off from the vital nourishment we need to stay alive. Delana, this dream would lead me to ask, what essential source of spiritual, emotional or psychological nourishment is missing from your life? Do you feel that you have not spoken up for yourself in some areas of your life that are important? And does this mean you now feel stuck, neither moving up nor down? If you were to speak out, to find your voice and say what you really feel, what do you fear would happen? Would it be worse than where are you are now? I find it particularly interesting that you use the words “(not on the) up and up” when talking about your relationship – a direct connection to the stairs symbol. Do you feel that you are making a compromise, and not sharing your true feelings here? Have you tried to rationalise a situation that deep down is not nurturing you? I think this dream is asking you to challenge the status-quo Delana. Step out into the open and speak your mind, or more correctly, your heart. In waking life you can practice by singing in the shower, reciting poetry aloud to the cat, the houseplants – whatever. Just practice hearing your own voice and loving it. Meditating upon the throat chakra, and imagining a beautiful blue lotus flower opening there can also help. Lapis lazuli is a stone connected with the throat and communication, try putting this under your pillow to encourage dreams of strong, powerful confident speaking. And hopefully as you speak your truth, then you will emerge from under the stairs, and ascend them to happiness, or descend them into your deeper Self. Either way, I hope you get moving again Delana. Would you like to have your own dream question answered on this blog?